This radio was brought to market by TYT in Feb. of 2017, and is targeted toward the same user group that would be considering the TH-UV8200D (except, at the moment, those requiring Cross-Band repeater capability). It uses the same waterproof body as the MD-390, and therefore the same accessories. It expands the channels to 256, and has a color display. Although there will be GPS and maybe dual band options in future models, these early release units do not sport those features. We have done some preliminary field testing and like the radio, it looks like it will become popular with recreational users and aspiring guides who cannot afford the extra expense, or do not need the advanced features, of the digital big brother, the MD-390 GPS. And like that radio, do not consider using the stock VHF antennas above 155 MHz, or in rugged field conditions encountered by guides or AT Skiers. For programming, there is the free OEM software available. This radio can be programmed with the same USB cable that is used by other Chinese radios that use the Prolific, FTDI, or Sil Labs chipsets. The software is presently "Ver 1.0", and it is rudimentary but gets the job done. 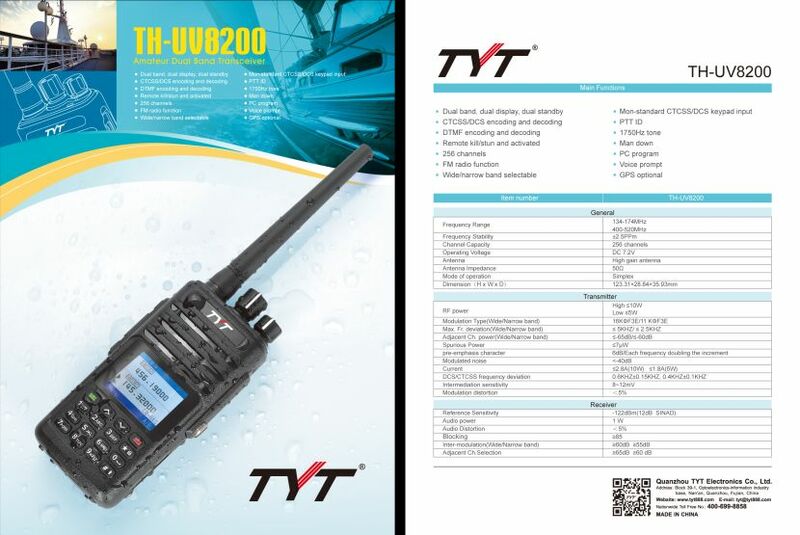 This below clip illustrates some of the VHF characteristics of the TYT UV8200 10W water resistant dual band radio by performing a series of field and bench tests after demonstrating Ver 1.0 of the stock programming software. 27:46-29:53 Ending credits and pack horses doing the heavy lifting. This demonstration shows the steps required for programming a repeater channel on the TYT UV-8200 from the front panel. 14:10 Discussion of some other settings that that are outlined in manual. ◘ additional 2200mAH Battery Pack (see video for capacity tests). From the factory by default front panel programming, often referred to as "field programming" is disabled. This is to mimic a business radio. The ham operator will want to enable front panel programming, which must be done using the software. Once enabled, the radio can be programming from the front panel or from the software. This radio cannot be programmed with CHIRP . The Prolific cable will work. The TYT USB programming cable connects to the speaker/microphone jack on the HT and USB on the PC.